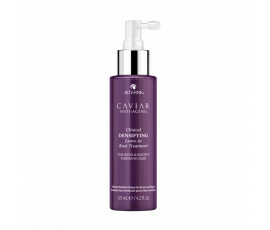 Alterna Caviar Clinical is perfect for hair that tends to fall out. All Caviar Clinical products contain Red Clover Growth Complex. This important ingredient leaves hair visibly thicker, fuller and voluminous. Red Clover Extract that eliminates toxins from the scalp while providing essential vitamins and nourishing elements, such as Calcium, Magnesium, Vitamin C, Vitamin B1, Niacin, Potassium and Phosphorus. Nettle Root and Palmetto (Serenoa Repens) that hinder ormonal DHT transformation. Vitamin B6 that turns carbohydrates into glucose for revitalising body cell functions and enhancing scalp microcirculation. Soy Proteins and Keratin that strengthen hair stem structure, adding volume. Algae Extract that soothes and hydrates the scalp. Taurine and Biotin that provide stronger hair.